As I mentioned in my previous post I will no longer be updating this blog. However, I did want to quickly pop in and let you know that I have a new online home. 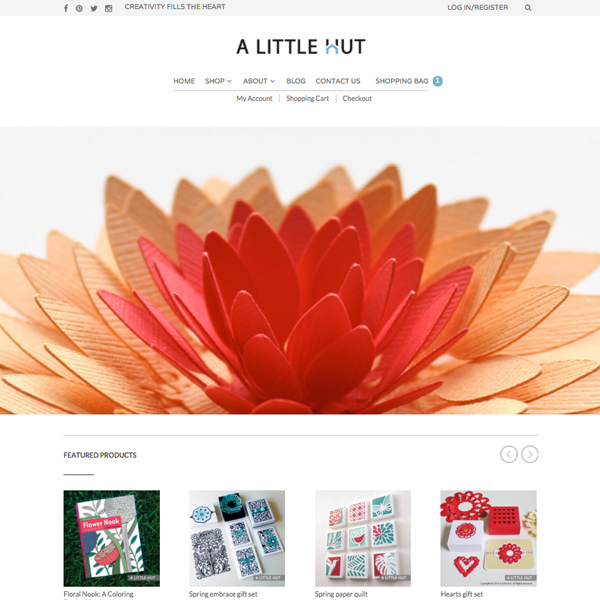 Please visit my new blog and site to keep up-to-date on all A Little Hut products. Thank you so much for visiting this blog (10 years flies by real fast) and I hope to see you on the new one. This is my 9th and last year of posting a mosaic on this blog. Now don't worry. I'm not going anywhere. I'll still be online but not on this blog. I'm working a new home for 2016 and I can't wait to show you. For now, this will be the last time I post on this blog. Sadly, I haven't had time to keep up with it. So my 10th year here was more of a fizzle than a going-out-strong — which in the end has made it easier to let go. Everything has its time and place. I cannot sign off without saying that the experiences that I had and the people that I met through this blog are unforgettable. I will forever be grateful for everything and for all of you that visited throughout the years. Thank you, thank you. 2015 was the year where I got more confident with my illustration. I will always be grateful for headed in this new direction. My paper creations will always be my first love but it was time to stretch myself in something new. I'm so very grateful to those of you that embraced my new work and supported me with the publication of my new coloring book Flower Nook. Who knew that self-publishing would be something I'd do this year? Who knew that I'd go back to what got me interested in art to begin with? My paper projects where fewer but I can see how my illustration started affecting their style. I like that too. I think combining my graphic and organic styles is an interesting angle that I'll be exploring further. 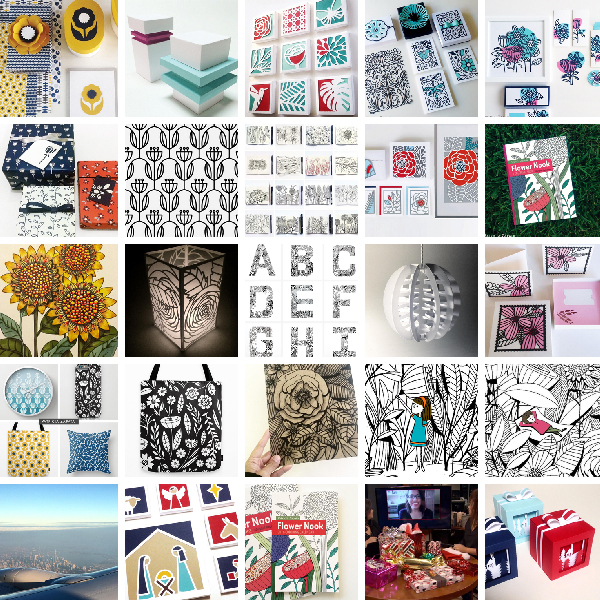 I'm working on a new site and new products so I'm ready for 2016 to get started. I can't wait. If you're curious my previous end-of-year mosaics are here: 2007, 2008, 2009, 2010, 2011, 2012, 2013 and 2014. Farewell Blogspot and hello new shiny site, that's in the works! (I'll post on Facebook and Instagram when it's ready). So excited to show off a clean slate! Thank you so much to those of you that have been around for so long be it here or anywhere where I happen to land online. Here's to a wonderful and shiny new 2016! Cheers and Happy New Year everyone! I finally got my hands on some paper! It felt strange to be away for so long. It doesn't help that my studio looks like a bomb hit it. I started a purging process mid-summer and I haven't quite gotten around to finishing the job. The mess is not very conducive to any creative endeavor at this point. I need to move this decluttering to the top of my to-do list asap. 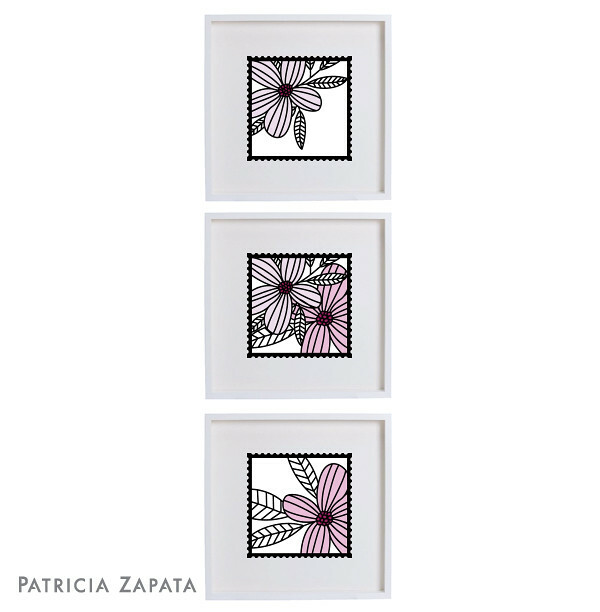 I was reading an article on stamp collecting when I was sketching ideas for this Daisy Duo Gift Set. I put the two things together and this is what became of it. 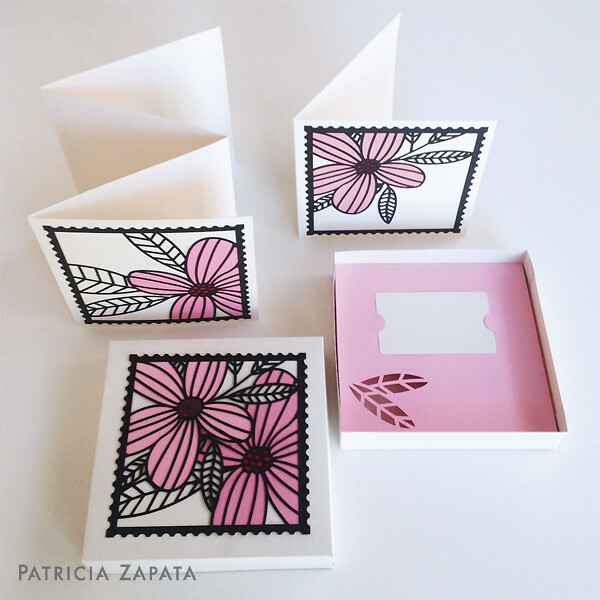 The set includes a gift box with a gift card holder, an accordion style card, a simple card and three different flower stamps. 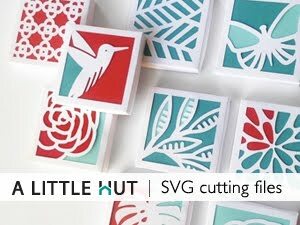 The negative spaces in the single flower designs allow for the addition of a stamped sentiment if needed. Below is an idea of a triptych that would be a very easy project to complete with the help of some frames. I favor Ikea frames for something simple like this. The subtle difference in pinks of the two flowers is something that I would keep in mind when selecting paper for this project. If the flowers were equal shades of pink the illustration would look very flat. By making the flower that is in the 'back' darker, a bit of visual dimensionality is added. You can now order the Daisy Duo Gift Set in the A Little Hut shop. Have a great day everyone—and enjoy the short week! The way my Mom tells it, it was my Dad who was the most concerned with keeping us stocked up on crayons and coloring books. That's where my love of artwork started. I loved coloring and drawing before I even started going to school. There's one thing that I haven't shared about how my coloring book came about. It's on the personal side of things – something I've never talked about – but I figure, why not share it? I've always known and believed that my artistic abilities are not my own. I was born with them — they are a gift from God. I draw, create, design because I'm compelled to, but also because, with time, I've come to understand that sharing my gift is a must. That's how I approach all my work but for whatever reason I had it more present than ever with the creation of Flower Nook. Coming up with 50 illustrations for the coloring book was challenging because I wanted each drawing to be unique but still feel like it fit in with the others in the book. When I couldn't come up with a fresh idea I started a little ritual of just closing my eyes for a moment and asking God what I should draw. I'd open my eyes and jump in. The images and ideas would just flow. It was as simple as that. It was like it was all meant to be. So, yes, this is a special book. I feel like I've come full circle with a destined purpose fulfilled. But it isn't the end of a path by any means. It feels like a new beginning – the start of a new phase of my work. Very exciting! So there you have it. Sorry for the mushiness. I just had to get this out. Back to more creating and for now the reality of putting clean laundry away. Haha! Diane and Kjansma, you are the winners of the Flower Nook: A Coloring Book giveaway. Congratulations! I will be in touch shortly. Thank you to all of you that participated and shared your thoughts on coloring. I loved reading every one of your comments and kind words. Too bad we all don't live close enough to have one happy coloring group — wouldn't that be fun!? 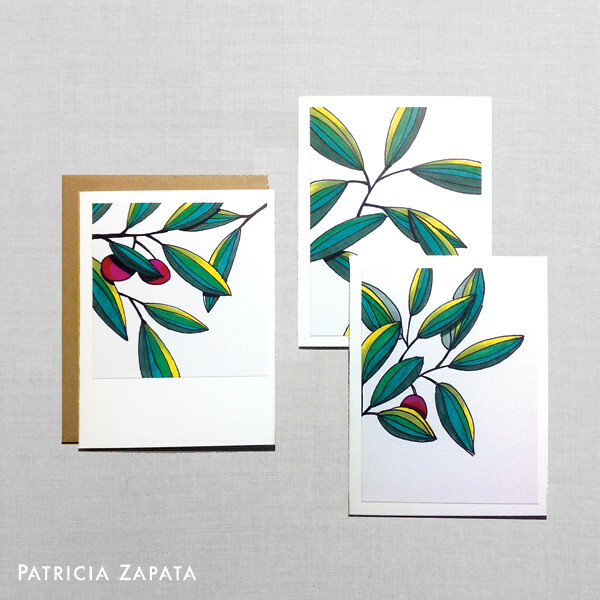 These are three new cards I made for my stash. My Mom liked my previous three (last post) so much I gave them to her, so I needed some replacements. Lol! -- I drew these illustrations on Borden & Riley Boris Layout Paper for Pens and then attached to A2 sized card stock. I used the Borden & Riley Boris paper to create all the originals for my coloring book. It also takes the marker ink really well. I will definitely be getting more of this paper soon! I am revamping my newsletter. I haven't been terribly creative with it and some of you may have unsubscribed from it (I don't blame you!). I have a new plan in mind and look forward to creating a weekly treat for your inboxes starting next Wednesday. If you'd like to join in the fun subscribe here!